It turns out that there were a few challenges to work around and a few new problems to solve, not least of which was mapping VR controllers to control an N64 game in a sensible way. One thing that wasn’t avoidable is that the N64’s rendered world may now pop in 3D, but it still springs forth from a rectangular stage. The N64, after all, is still only rendering a world in a TV-screen-sized portion; anything outside that rectangular window doesn’t really exist, and there’s no way around it as long an emulated N64 is running the show. Still, the result is impressive, and a video demo is embedded below where you can see the effect for yourself. Voice recognition is this year’s model for home automation, but aside from feeling like you’re onboard the Aries 1b arguing with HAL 9000, it just doesn’t do it for our geeky selves. So what’s even geekier? How about carrying around an ocarina in your pocket so that you can get a Raspberry Pi to unlock the door for you? (YouTube video, embedded below.) Yeah, that’ll do. [Sufficiently Advanced]’s video gets us 90% of the way toward replicating this build. There’s a tube with a microphone and a Raspberry Pi inside. There are a bunch of ESP8266-powered gadgets scattered around the house that take care of such things as turning on and off the heater, watering plants, and even pressing a (spare) car remote with a servo. We’d love to know what pitch- or song-recognition software the Raspberry Pi is running. We’ve wanted to implement a whistling-based home automation interface since seeing the whistled. We can hold a tune just fine, but we don’t always start out on the same exact pitch, which is a degree of freedom that [Sufficiently Advanced]’s system doesn’t have to worry about, assuming it only responds to one ocarina. If you’re questioning the security of locking and unlocking your actual apartment by playing “Zelda’s Lullaby” from outside your window, you either overestimate the common thief or you just don’t get the joke. The use case of calling (and hopefully finding) a cell phone is reason enough for us to carry a bulky ocarina around everywhere we go! [Basil Shikin] was thinking about different types of locks, and was trying to come up with a locking solution that he had yet to see. It dawned on him that he had never come across a lock triggered by music, so he set off to construct one of his own. 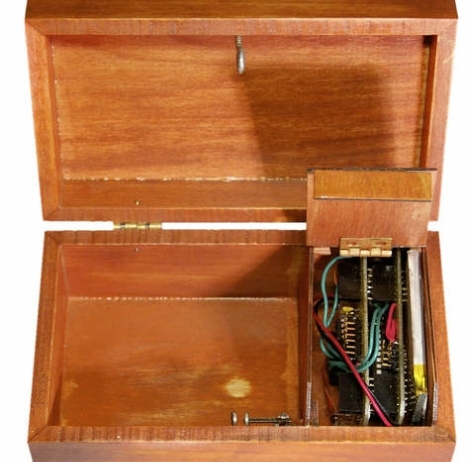 He ordered a wooden chest online, then proceeded to piece together the electronics required for the locking mechanism as well as the music detecting logic. Using an Atmega328P paired with an electret mic, his system listens for a particular tune (the Prelude of Light from the Ocarina of Time) to be played , which triggers a tiny servo to undo the latch. To do this, he implemented a version of the Goertzel Algorithm on the Arduino, allowing him to accurately detect the magical tune by frequency, regardless of what instrument it is played on. Be sure to check out the video below to see his musical lock in action.